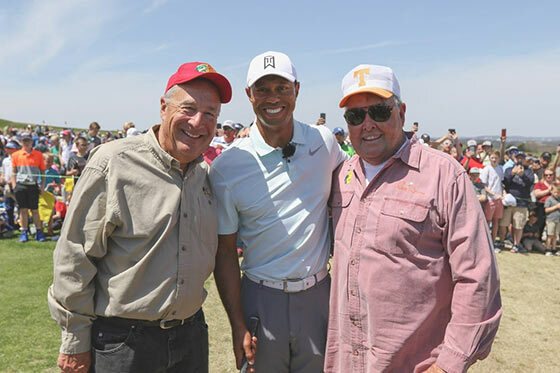 Golf great Tiger Woods and fishing legend Bill Dance entertained nearly 8,000 registered kids and families at a free golf and fishing clinic to kick off Bass Pro Shops Legends of Golf at Big Cedar Lodge. Hosted by Bass Pro Shops founder Johnny Morris and Tracey Stewart, widow of late, local golf great Payne Stewart, the free event offered Ozarks-area children and families an up-close-and-personal experience with two of the most iconic names in sports. Gathered before a crowd of thousands at the award-winning Buffalo Ridge Springs course, the two living legends put their skills on display to share golf and fishing tips and techniques with excited youngsters. The 79-time PGA Tour winner talked the crowd through his warm-up routine, demonstrated his approach to various golf shots and reflected on his own childhood experiences in the outdoors with his father to underscore the importance of kids getting outside. Woods and Morris are partnering together to create the first-ever public access golf course designed by Woods’ TGR Design. Scheduled to open in 2019 and named in honor of late local golf legend Payne Stewart, the new “Payne’s Valley” course will be a world-class championship course intended to connect more people to nature by growing the game of golf and outdoor recreation. The Woods-designed course is also intended to cement Big Cedar Lodge’s status as “America’s Next Great Golf Destination” with world-class facilities designed by Jack Nicklaus, Tom Fazio, Gary Player and Ben Coore and Bill Crenshaw. Joining Woods at the event was legendary angler Bill Dance, who first befriended Morris on the professional bass fishing circuit in the 1970s. Since that time Dance has gone on to host one of the most successful fishing shows of all time and become one of America’s most beloved anglers. During the event the always-affable Dance shared some of his signature tips for catching bass. Participants at the kid’s clinic could also enjoy a village of outdoor-themed activities including a massive bass bounce house, catch-and-release ponds, archery ranges, air rifle experiences and live animal displays. The event was just the start of action during the 2018 Bass Pro Shops Legends of Golf at Big Cedar Lodge. PGA TOUR Champions compete in tournament action Thursday-Sunday with special activities for kids and families throughout the weekend, including special appearances by Mark Wahlberg, Kid Rock, Larry the Cable Guy, Willie Robertson and Dude Perfect. Purchase tickets today by visiting www.bassprolegends.com.